This skirt I made with an altered version of this pattern of Skirt A. I used a t-shirt for the fabric. There is no elastic in the waistband, but that certainly would help it stay on a little better. 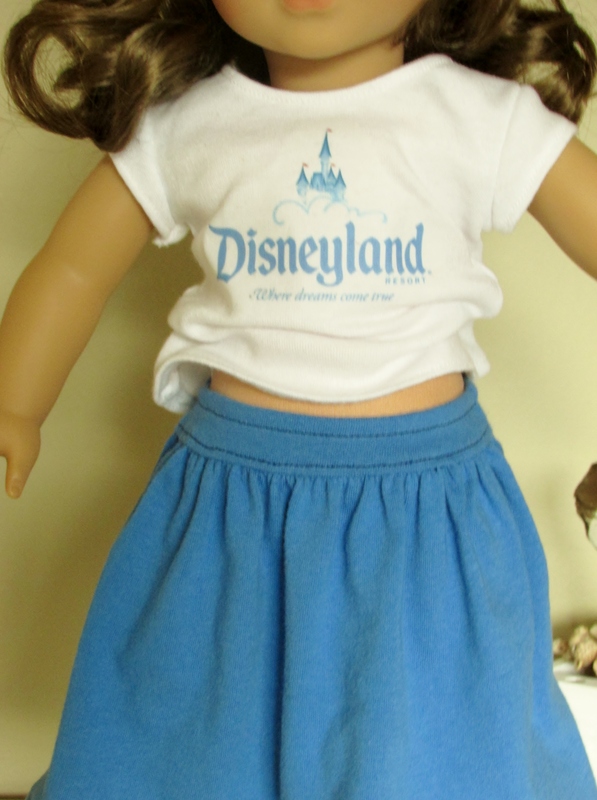 The skirt goes very well with the Disneyland T-shirt! My blog count has reached over 5,000 views! Wow! This black skirt I made from Simplicity 4297. I believe it is Skirt A. 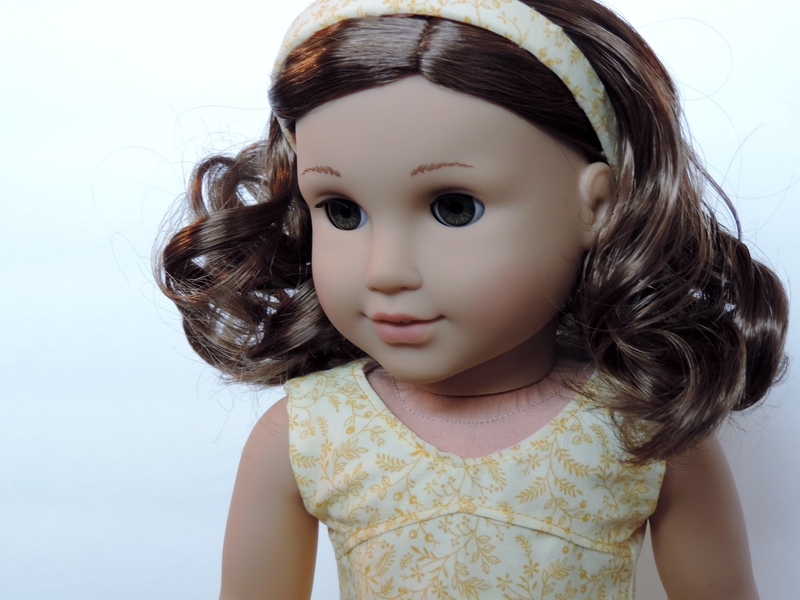 The fabric is stretchable in 4 directions. I bought it as a remnant. I made the skirt to try out the pattern a little bit more, and I made this skirt fully lined. It has a waistband, although you can’t see it in the photos. I may list skirts made from this pattern in my Etsy shop when I open. 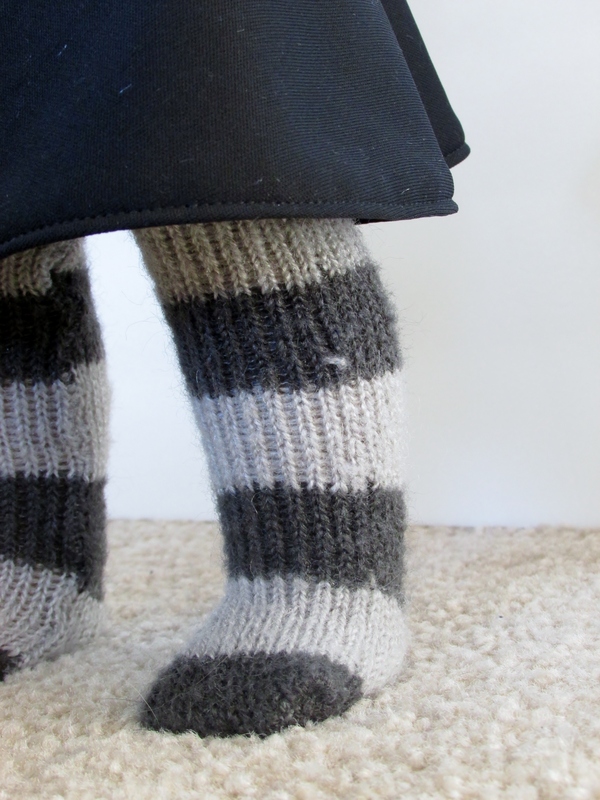 The stockings are up-cycled from a human sock. 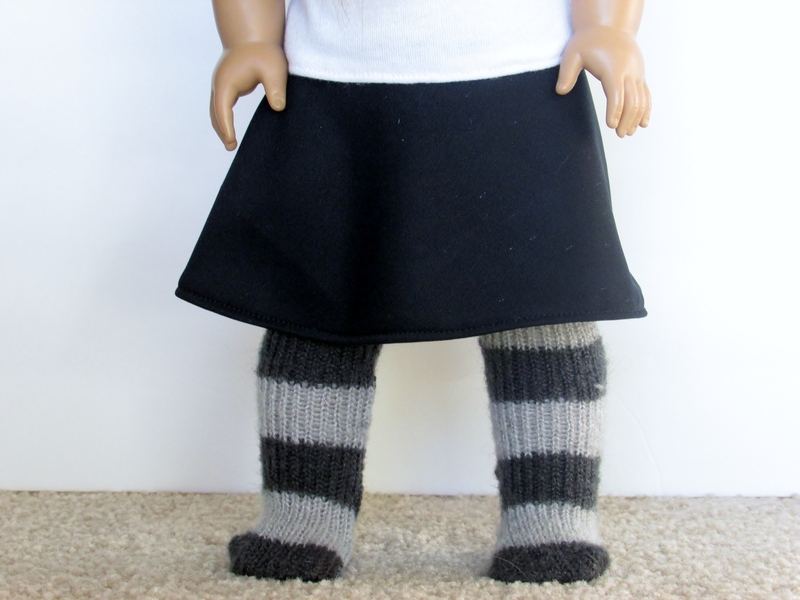 On the doll, the socks are knee highs and look very warm and thick. The green and blue flowers are actually soft paper embellishments, from Prima. Therefore, this sort of clip wouldn’t work for small children but for photos and such it’s sweet 🙂 I simply hot glued the two flowers together, then glued a small rhinestone to cover the hole the flowers have in the center. These holes are for scrap booking brads to go through. I could have used a brad to cover the hole, but the rhinestone adds a bit more to the look than a brad would. After the flowers were all put together, I glued them to a one inch alligator clip. Voila! Great accessory for summer dresses! 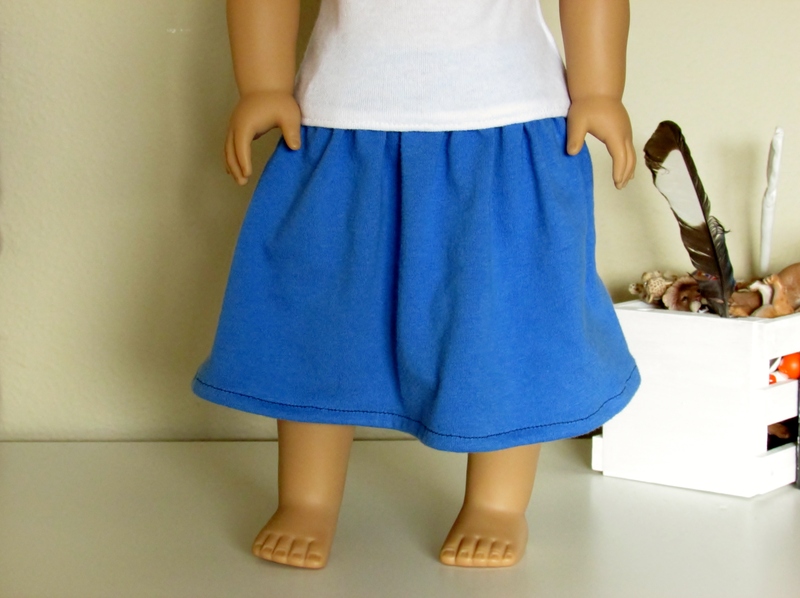 This skirt is made from the Liberty Jane Mini Skirt pattern. I up-cycled the skirt from cargo pants. 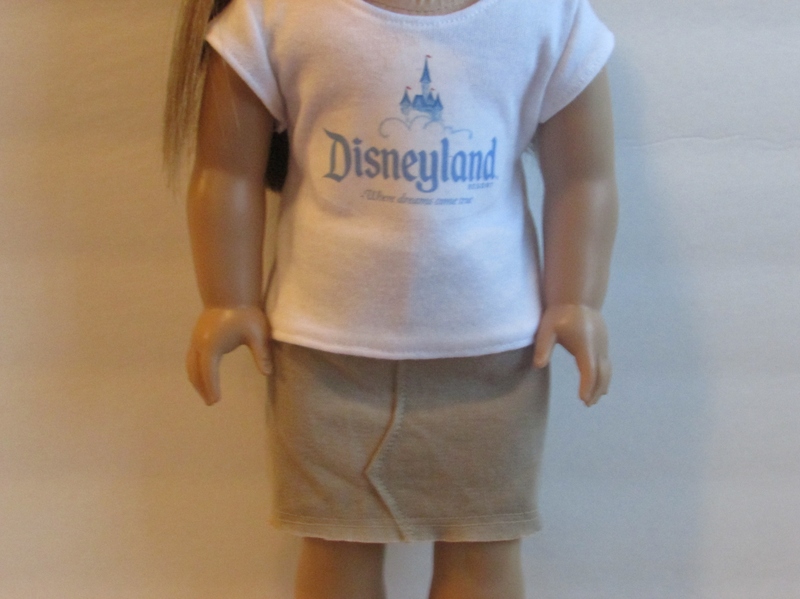 The skirt is rather tight-fitting around the waist. I think this may be due to the weight and stretch capability of the fabric. I didn’t hem the edge, just stitched twice and pulled the strings to make a frayed edge. The pics aren’t fantastic, because I was running out of daylight! You can still see the skirt though. 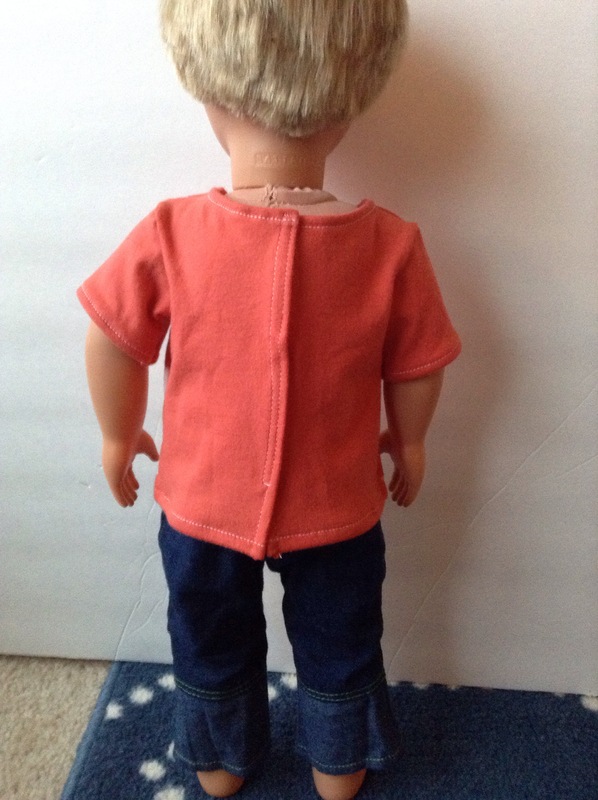 Today I want to share some pictures of one of the few articles of clothing that I have bought for my dolls. 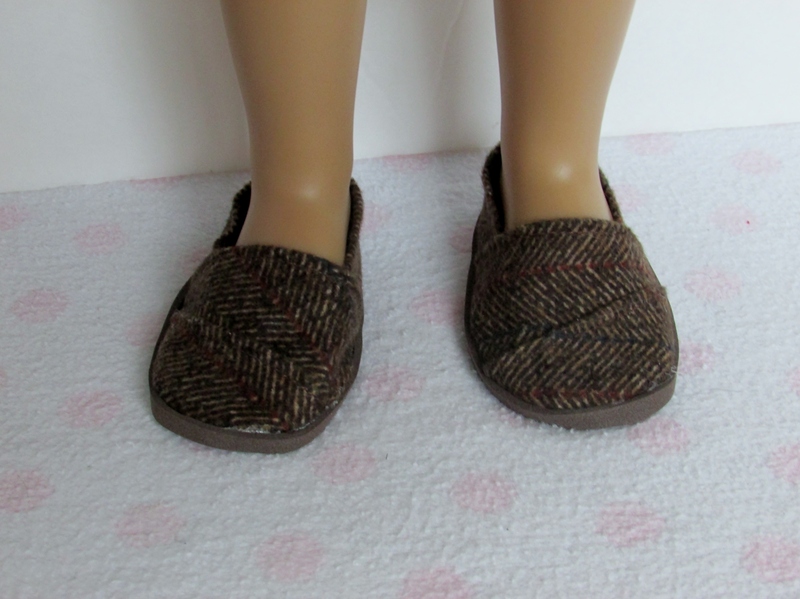 In fact, other than shoes, this is the only article of clothing I have ever bought for my AG dolls. 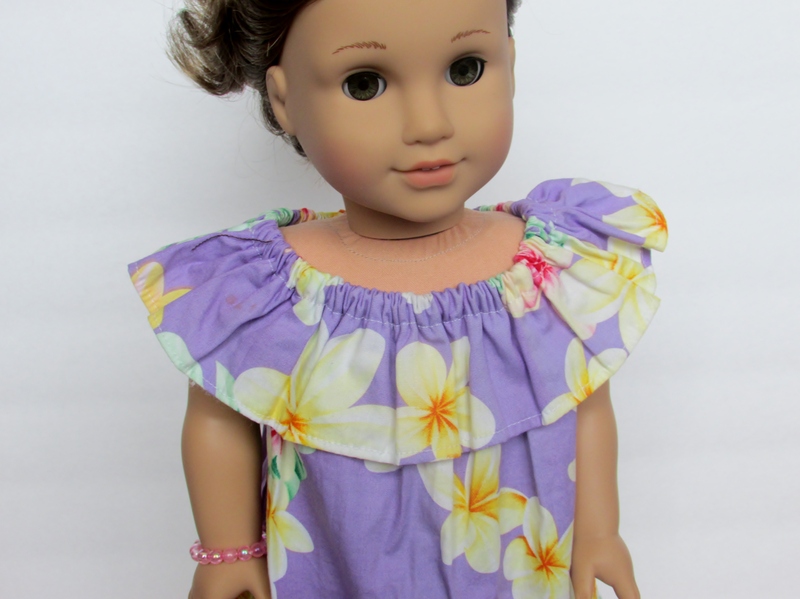 Interestingly, when I got this dress I didn’t even own an American Girl Doll! 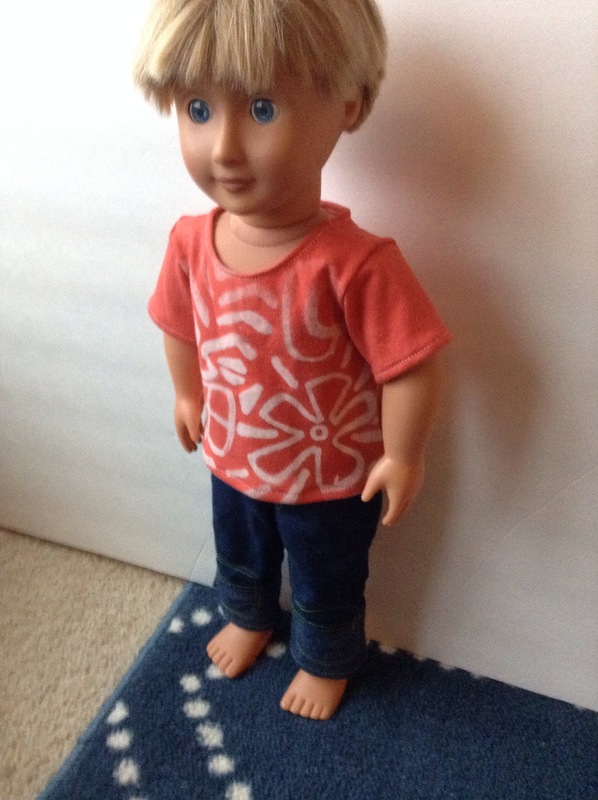 I did have an Our Generation doll, however. I was on vacation in Hawaii, and the hotel I was staying at had a booth in the lobby one day. 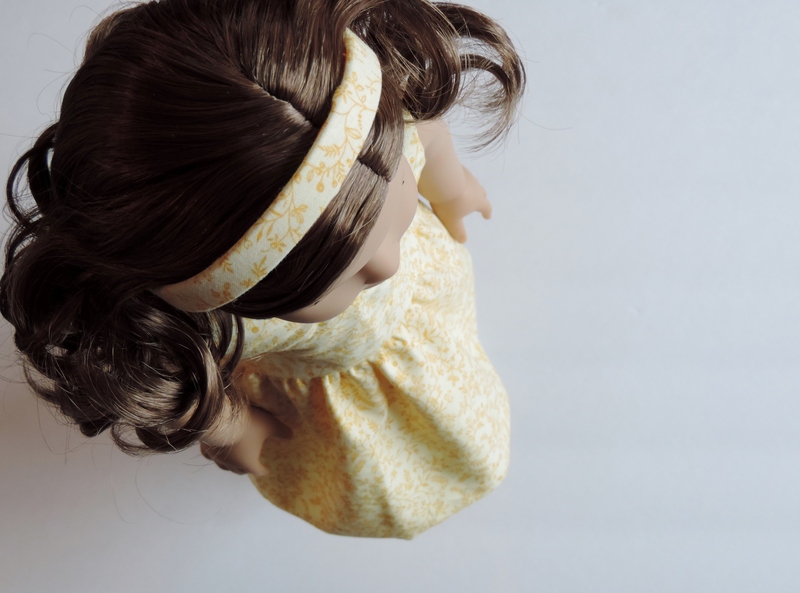 The booth was selling dresses for 18″ dolls. 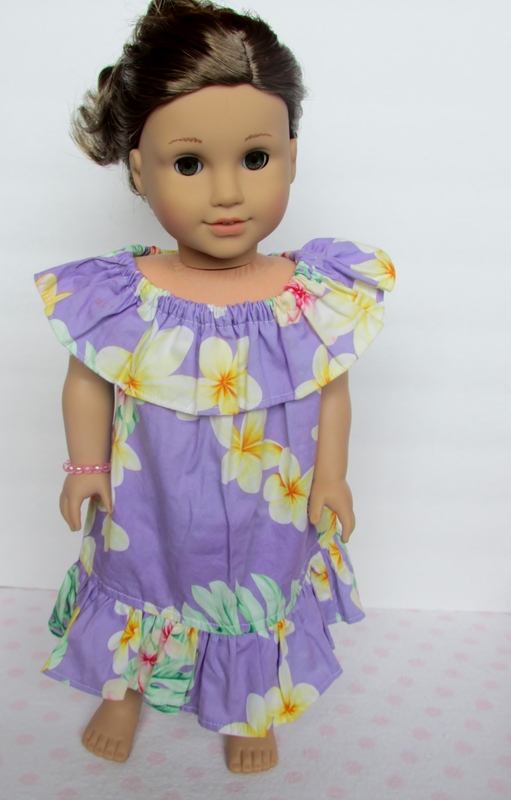 I don’t remember how much this dress cost, nor if there were other color options. 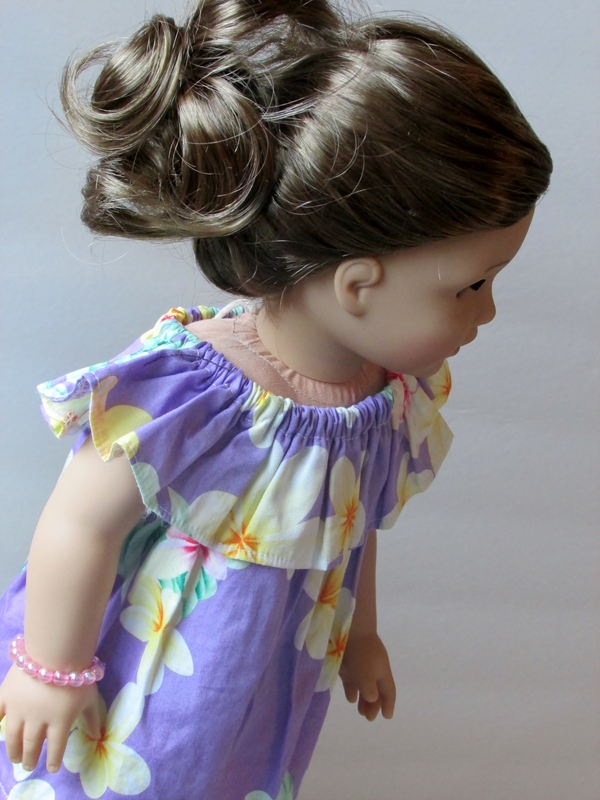 I tried out a pony tail hairdo on Rebecca’s curly hair. 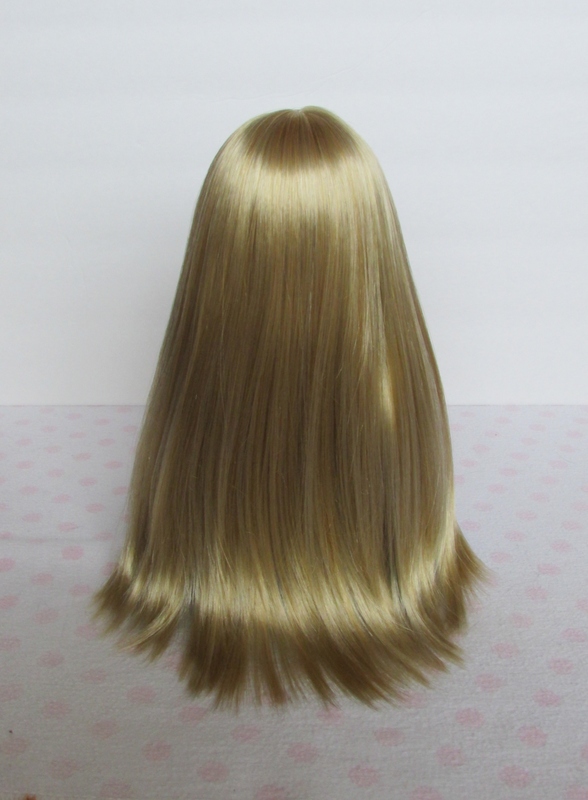 When her hair is down, it hides her face. 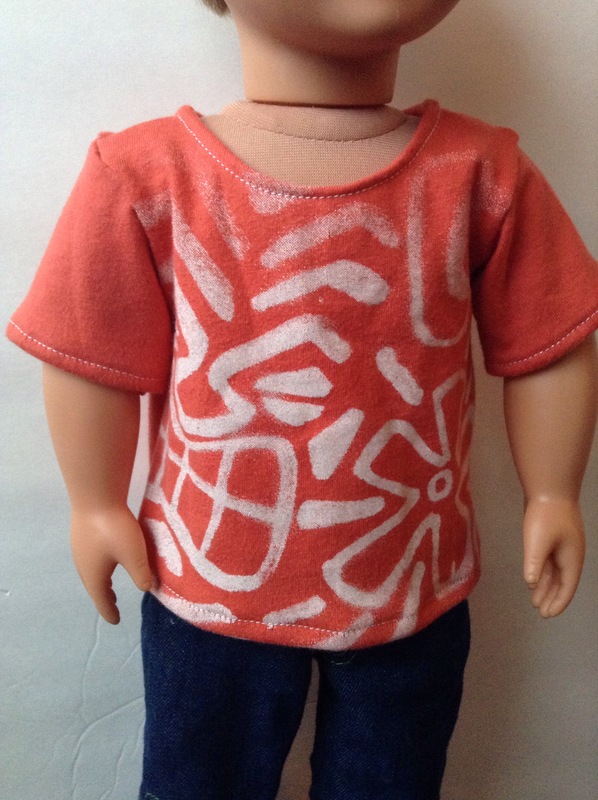 I wanted to make a t-shirt that would fit a boy doll today. 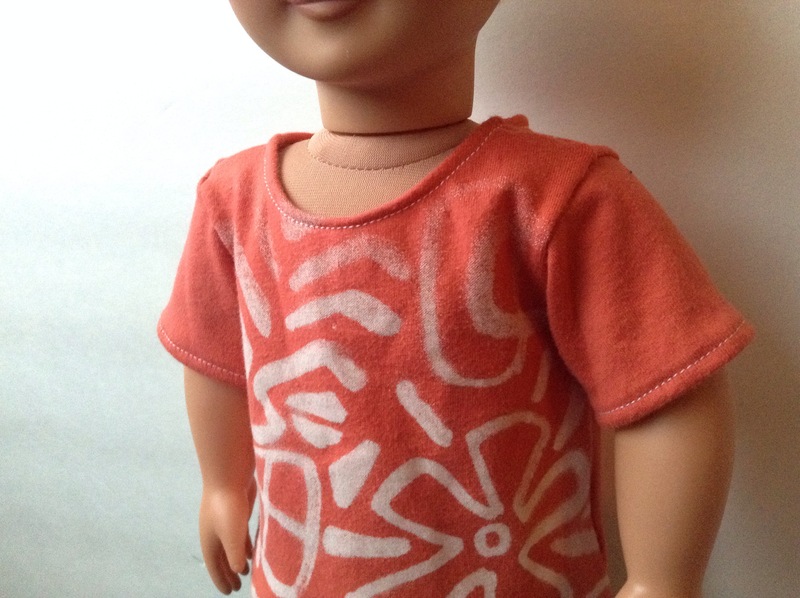 Boy dolls can fit in girl t-shirts, but they are form fitting and it doesn’t look very boyish. I took this free pattern, and made some changes to it! 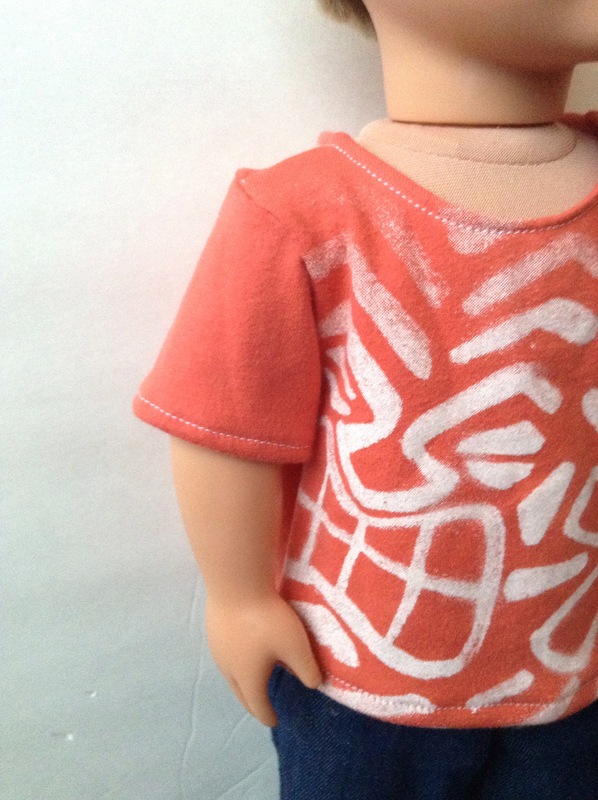 I lengthened the sleeves, and changed the pieces of the top to go straight, not curve with the cloth body. I also changed the sleeve piece to allow for a baggier sleeve. This shirt is up-cycled and pressed to get any wrinkles out. Anyway, my Etsy shop, that will be opening soon, is beginning to form! I’ve got some items ready to be listed as soon as I open. I created a website for my shop and the link will be posted here soon. The website has a sneak peek of what I will be offering! 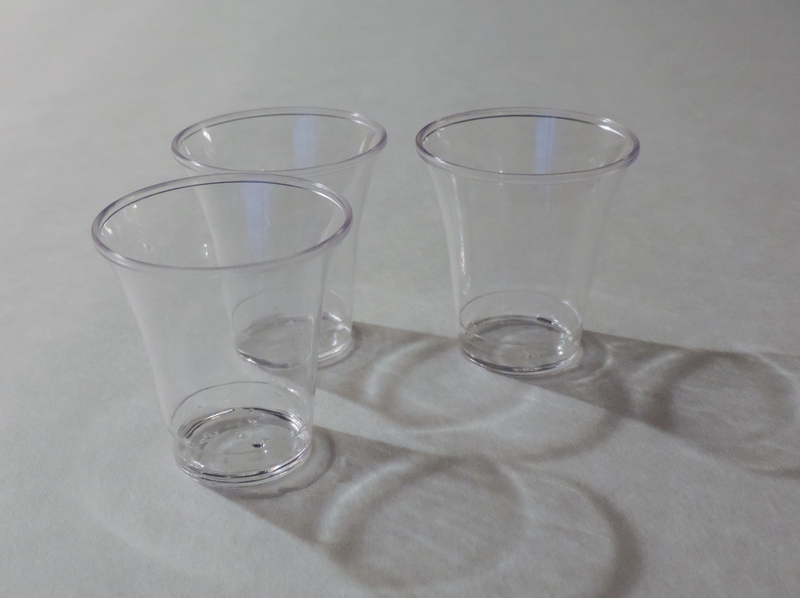 I came across four plastic disposable cups that are small enough for dolls! 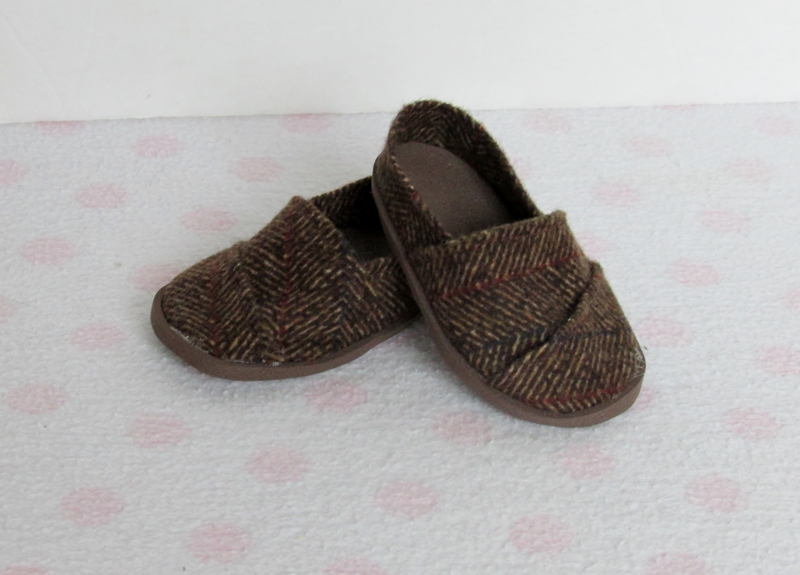 They can hold them with the help of tiny elastic bands. 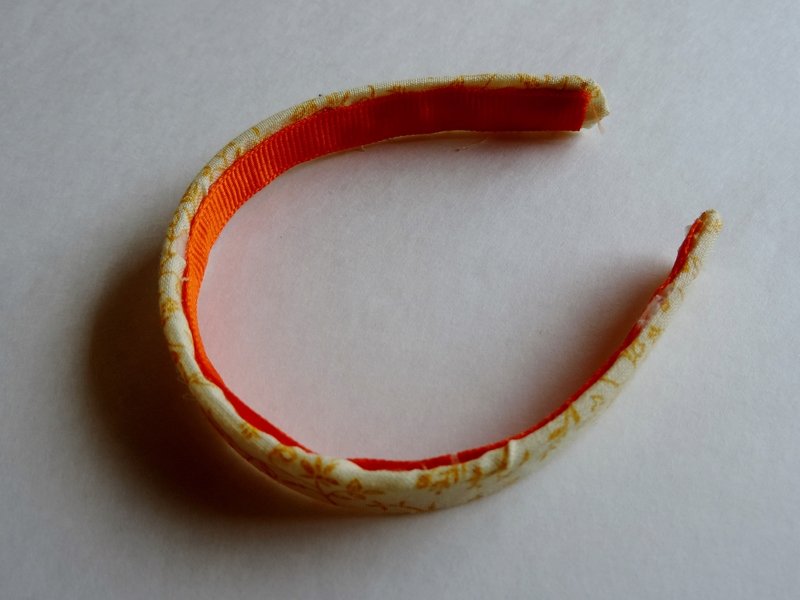 The tiny elastic bands are actually rubber bands that are used during orthodontic treatment! 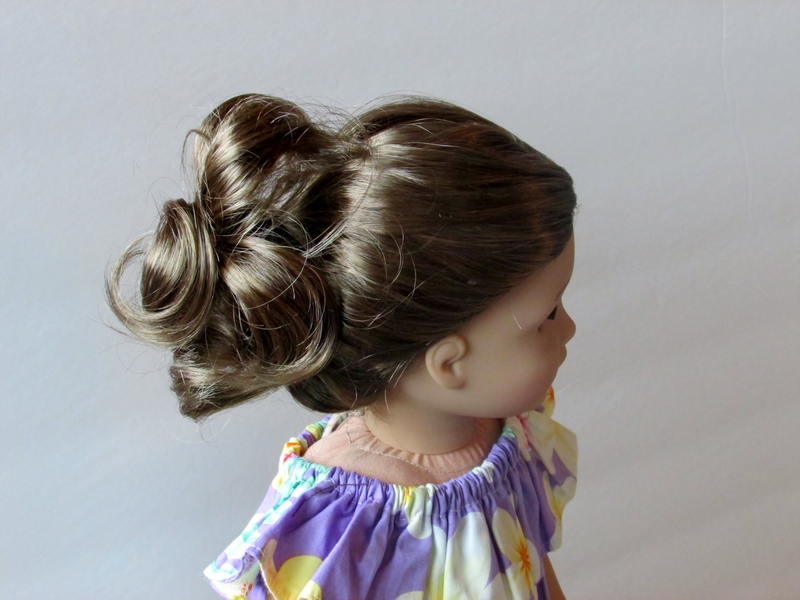 These bands are perfect for doll hair because they are small and clear. 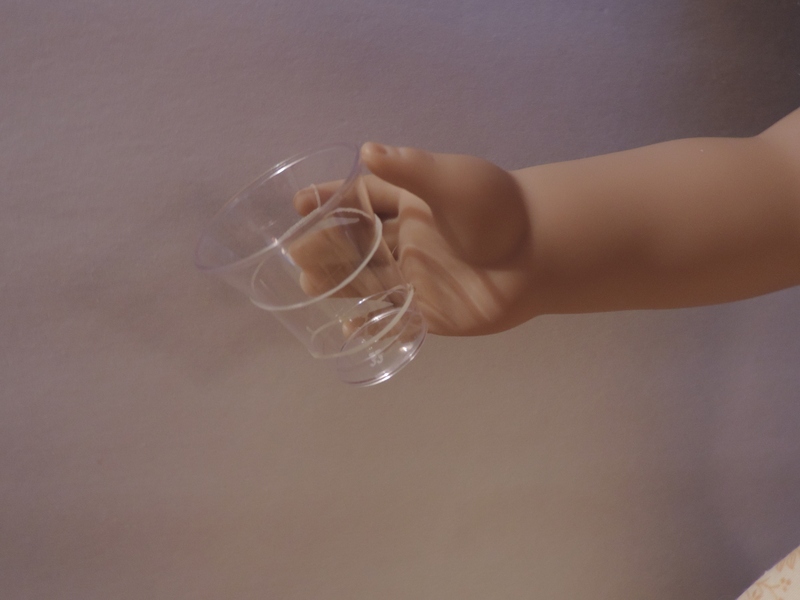 They are also useful for attaching something to a doll’s hand. 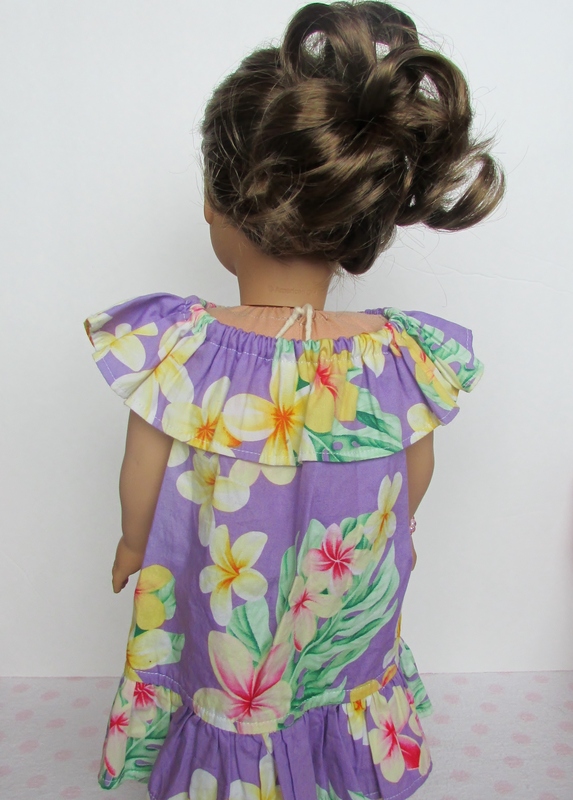 Yesterday I made another dress from the Lisianthus Dress pattern on Pixie Faire! This time it’s in a floral-y yellow fabric. The skirt on this one is slightly different. Once again I didn’t have a piece of fabric 37″ long (as the pattern requires), therefore I was compelled to make the skirt less gathered. 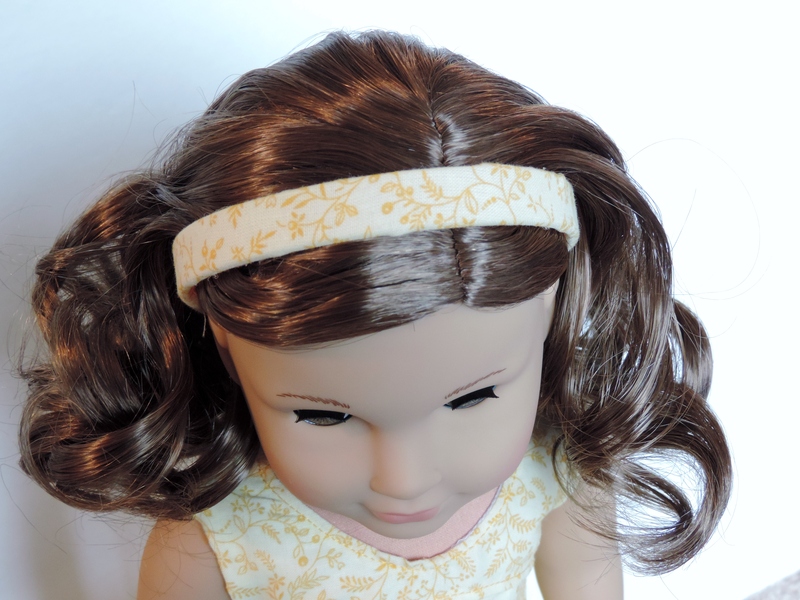 The headband is from Hair Hardware and it is designed for 18″ dolls. I bought the 12 pack, which was $4.10. If you sign up for their newsletter you can get a 10% off coupon as well. The headband fits perfectly, and is flexible. I wrapped it in the same fabric as the dress, securing it with hot glue as I went. The inside raw edges I covered up with a strip of ribbon, also hot glued in place. 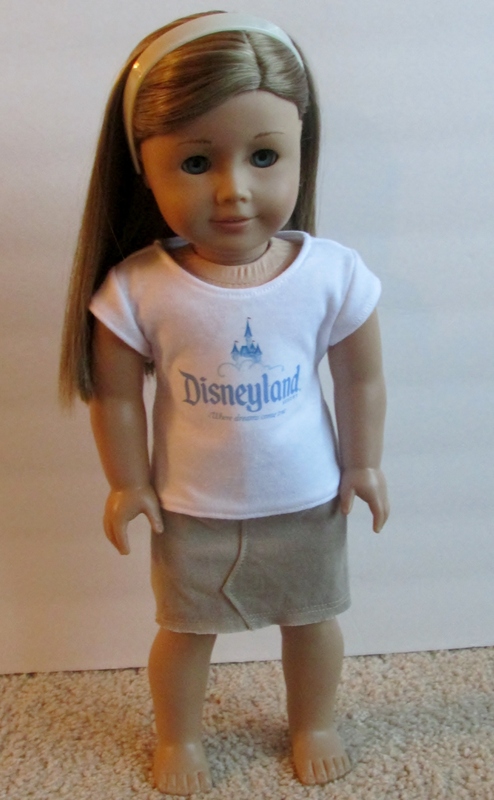 The doll didn’t have shoes to go with her dress (oops), so she wore her favorite glittery tennis shoes. 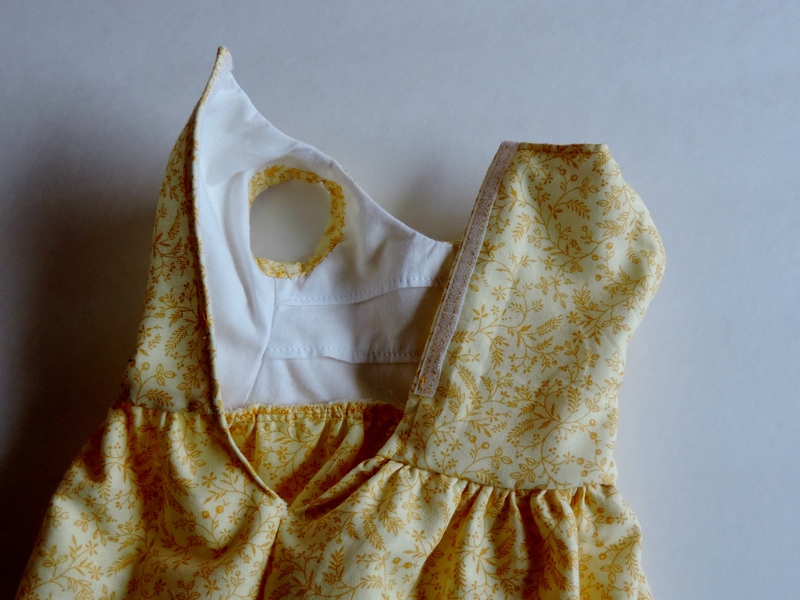 The bodice of the dress. The back closes with soft Velcro. The dress is fully lined. Both the girls together in their new Lisianthus dresses!